God restores us in the midst of all the sin and brokenness in the world through His Word. God’s Word creates a new reality for us. God’s word of forgiveness pronounces us righteous and we are, in fact, righteous before God. And, Martin Luther reminds us, where there is the forgiveness of sins, God promises life and salvation. 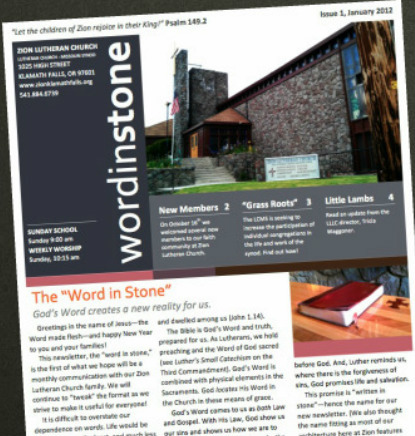 This promise is “written in stone”—hence the name for our newsletter, the "Word in Stone." (We also find the name fitting as most of our architecture here at Zion features beautiful lavender and grey stone.) May we cling to God’s promises to us through faith in His Son, Jesus. Be sure to check out the MissionExtra, a supplemental newsletter devoted exclusively to the mission of the Church!